An incredibly touching interview with a Calgary veteran following his viewing of the premier of Christopher Nolan’s blockbuster. More than you ever wanted to know about the Panzer III! The following post was originally written (not by me) and posted to the Dartmouth Library blog. I’m including the entirety of the post in hopes of spreading the good word about Mr. Gardner and his work during WWII. On June 6, 1944, Clinton Gardner, Class of 1944, found himself digging a foxhole on Omaha Beach as part of the D-Day invasion of German occupied Europe. The landing area was already strewn with bodies and the Germans were raking the incoming allied forces with artillery and machine gun fire. Gardner, a Lieutenant in the artillery, was not about to move any further inland until the infantry made a hole in the German defenses, and that did not seem to be about to happen. An incoming round suddenly exploded in front of him. His head snapped back and then a curtain of blood blinded him. In his memoir, D-Day and Beyond, Gardner recounts how he stood up and staggered toward two of his fellow officers wiping blood from his eyes. The two officers stared at him in horror. Then he reached up and felt his helmet. There was a gaping hole, large enough that he could get two hands into it. Gingerly he felt around and found that he could feel a soft, mushy surface that he assumed must be his brain. Sick and disoriented though he was, he managed to get his first aid kit out and pour sulfa powder into the hole and then stuff it full of gauze. Unable to walk or speak properly, Gardner watched as his unit packed up and began to move inland, following the infantry who had suddenly begun to advance. The other officers told him that they would send medics back for him. He was soon alone on the beach with a handful of wounded and dying soldiers, all of whom would have been killed by German mortar fire had not a group of British troops happened along. The British moved the wounded Americans up the beach to a sheltered area among some rocks. After 23 hours wounded on the beach, a group of medics finally arrived and moved Gardner and the others to a field hospital in Vierville. There Gardner made the happy discovery that what he had felt through the gash in his helmet was not his brain, but badly lacerated scalp tissue. Though his skull was scarred, it was not broken. Getting the helmet off was another matter: it took three doctors and a fair amount of pulling and twisting as the edges had curled in and were imbedded in his scalp. Eventually Gardner was sent back to England to recover, but that was not the end of the war for him. Later he would find himself being bombed by friendly fire during Battle of the Bulge and still later he would serve as the American Commandant at Buchenwald following its liberation. Gardner’s helmet remains, to this day, the most damaged helmet whose wearer survived his wounds. To see Clint Gardner’s helmet or to read his letter home ask for MS-1109. A guide to the collection is available. To read his book, D-Day and Beyond, ask for Alumni G1728. From time to time new information comes along to help identify photographs from my collection. 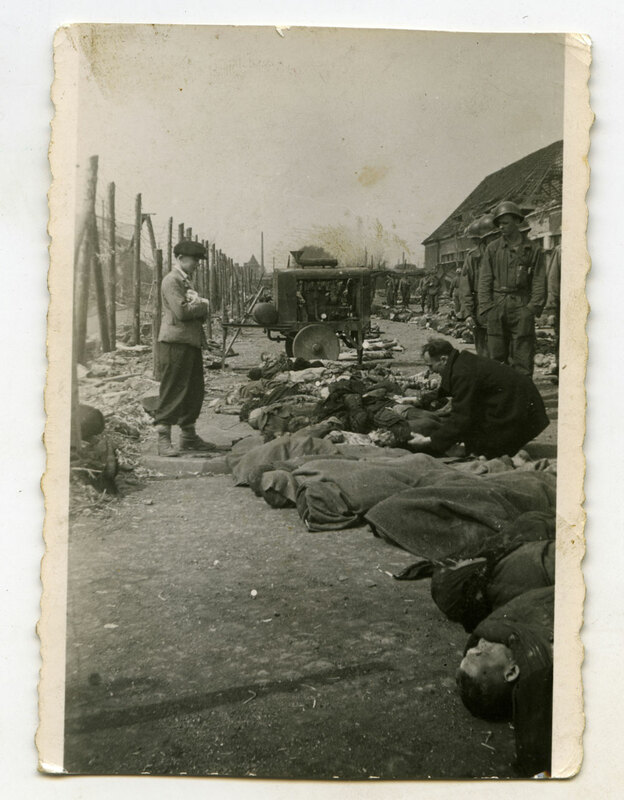 In this case, I stumbled across an image during research into the liberation of Nordhausen (Mittelbau-Dora) concentration camp. 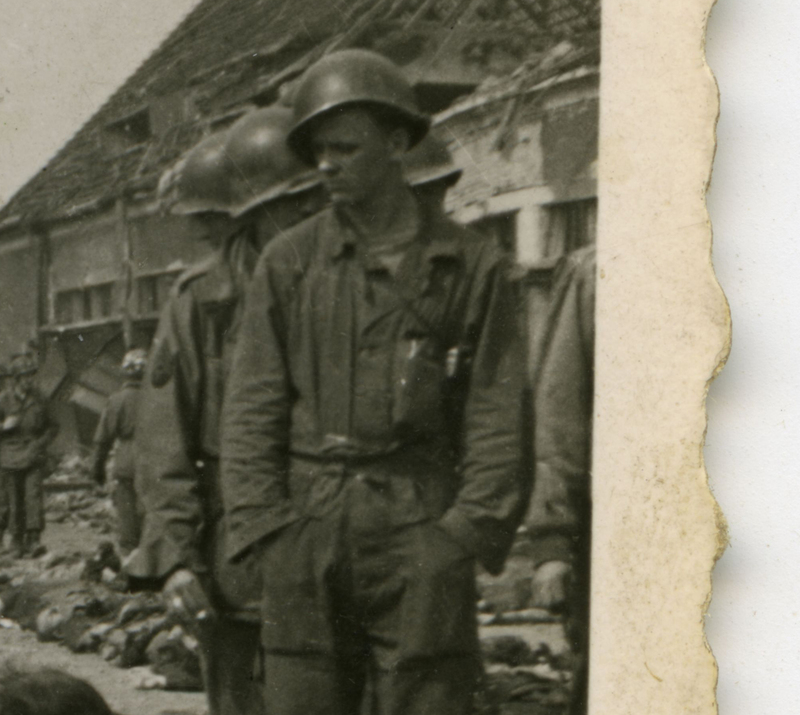 The image in my collection (seen below) was originally misidentified as having been taken at Dachau, but I just recently learned that it was actually taken at Nordhausen (Mittelbau-Dora) and captures a moment that US Signal Corps photographs also snapped at different angles. According to information I’ve picked up in the past few days, the young boy was named Michael Kallaur and the father is Walter; both men buried the boy’s grandmother (Walter’s mother) after finding her body in the unfortunate lineup at Nordhausen. 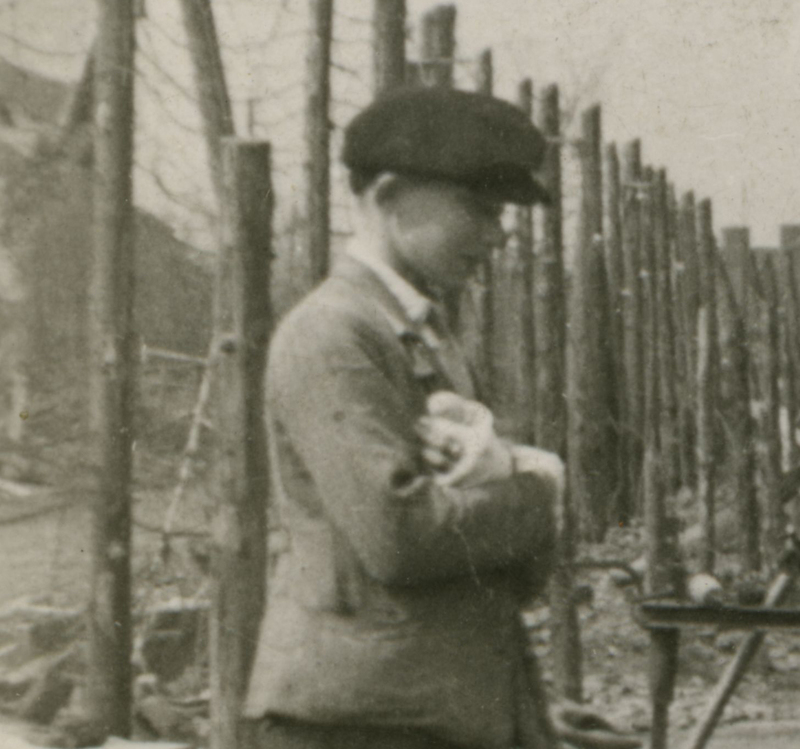 Elizabeth Kallaur was killed at the camp only a few days before the liberation. 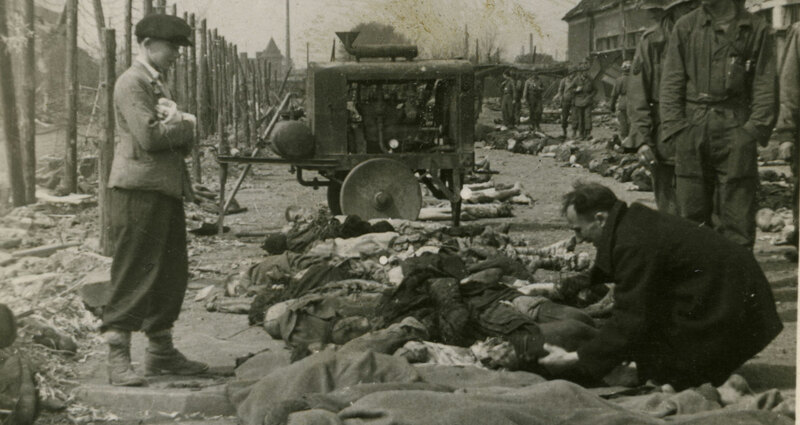 According to information at the United States Holocaust Memorial Museum, the Kallaur family was sent to Nordhausen as punishment for helping Jews in the Pinsk region. The coat seen covering Mrs. Kallaur was given to Michael by John Florea, the Signal Corps photographer. Walter and Michael would not allow German citizens to touch the body of Elizabeth, and she was the first to be buried (at a deeper level) in the first burial trench. After hours of internet research, I came across the following Signal Corps photo and instantly recognized the boy…. 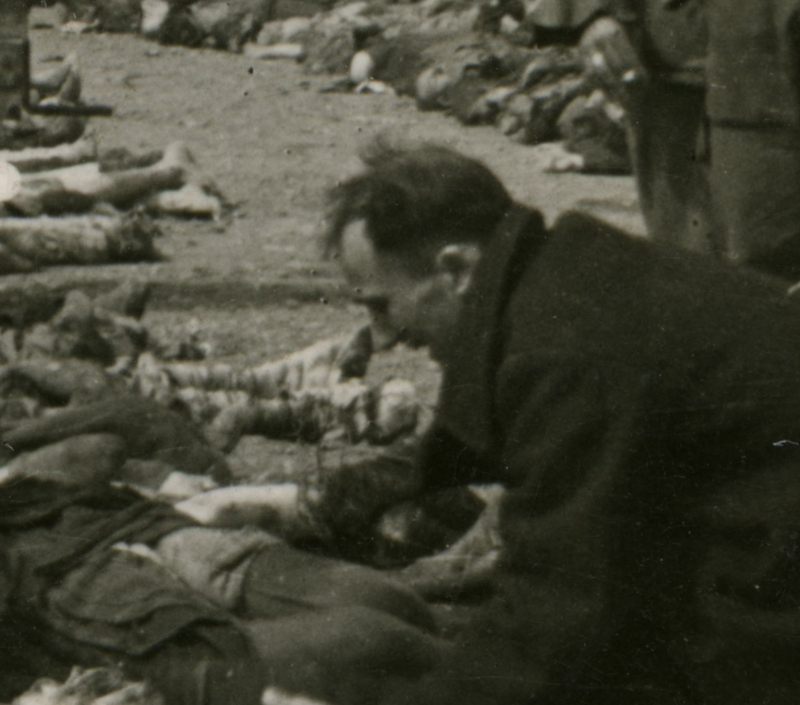 Figure 1.–Here a Polish boy weeps over his grandfather’s body at Nordhausen after it was liberated by the Americans. It was dated April 21, 1945. That may have been when the photographed was released rather than taken. The press caption read, “Weep for the dead: A Polish boy weeps bitterly after he and a man at left buried (the) youngster’s grandmother who had died while a political prisoner of the Nazis in concentration camp at Nordhausen. Germans in the town were ordered to dig graves and bury the 2,500 dead, unburied prisoners found there by occupying American forces. The Polish boy refused to let the Germans touch his grandmother and insisted he bury her himself. Yanks look on in quiet sympathy.” We doubt if his grandmother was a political prisoner, but like the boy a slave laborer at Dora. He probably searched for her after the camps were liberated. Notice the German civilians at the right. The information on the card all matches up. As seen in the previous images, he had a visibly wounded left hand; the card confirms this and the fact that his place of birth was Pinsk, Poland. At the time of his arrival in the US at Niagara Falls, he was 18, putting his birth year at 1931. The Signal Corps photographer noted his age in 1945 at 14, which matches up with the immigration card. A website dedicated to the Kallaur family tree referenced a Walter Kallaur arriving in the Niagara region after the war; this jives with both the Signal Corps caption and the fact that Walter is referenced in the above 1949 border crossing documents. He arrived in Quebec in April of 1948 on board the MV Beaverbrae (listed as the SS Beaven Bren in the document, a ship that eventually transported over 30,000 European refugees to Canada between 1947 and 1954. Sadly, it appears that Michael passed away in Decemeber of 2000, so my hopes of reuniting this photo with him has been dashed. His SSN confirms that he lived in Pennsylvania and was issued his card in 1955, six years after his entry into the US. My internet sleuthing tends to be obsessive at times, and I’m fairly certain with the following deduction. I will leave out the details of the research in respect for the Kallaur family; some things are best left unsaid. From what I can deduce, Michael married Eileen Gallagher at some point in the 1960s. Eileen was born in 1944, and was only five years old when Michael came to the US in 1949. Ancestry.com doesn’t provide marriage records for the couple, but I’m basing my marriage dates in accordance with the birth of their forthcoming children. My hopes are that a family member will google themselves, or possibly have a Google Alert set…….. All are originally from the Philadelphia, PA area. Casual followers of this blog will know that I never post photos of death or destruction. My main goal is to present historic photography in a way to help educate internet followers about the world of war. In this case I will post a photo that may be hard for some viewers to see. I have hundreds of photos of concentration camps in my collection, yet have never been moved to post any of the photos to the web. This image called to me. The composition, the subject, the setting. It’s all there. A soldier snaps a shot at Dachau of a man holding the feet of his dead wife while his injured son watches on. A procession of 3rd Armor Division soldiers file by as this tragic event unfolds; the event captured through the lens of an unknown soldier of an unknown family. This scene was likely replicated tens of thousands of times at the tail end of the war. It’s a rare occasion when I’m able to write about a WWII veteran from my hometown of Southbridge, Massachusetts. PortraitsofWar (this blog) was started in response to the passing of my grandfather; my interest and dedication to WWII history was fostered during my childhood, when my grandfather would regale me with tales of his experiences as an assistant driver in an M4A3 Sherman Tank as a tanker in the 777th Tank Battalion/69th Infantry Division during WWII. Without his inspiration, this website would’ve never been created. This specific post is a long-awaited writeup related to a grouping I purchased last year. While cruising though an eBay listing, I noticed a last name in a auction heading that caught my eye – Walter Ciesla WWII ID Bracelet and Patches. Growing up in Southbridge, Massachusetts, I knew a few Ciesalas from my middle school. I decided to click on the auction link and was amazed to see the ID bracelet’s inscription: WALTER CIESLA – SOUTHBRIDGE MASS. How close did we live apart? According to Google Earth, we grew up (60 years apart) 0.28 miles from each other. Walter and I likely hiked the same wooded trails and drove the same way to church and school. Not much has changed since 1940 in terms of roads, schools and churches. Walter was shot down on mission over Yugoslavia in November of 1944 but somehow found a way to evade German observation in the area. He was wearing the ID bracelet at the time (these were always worn during flights to ensure body identification in case of crashing) and was able to eventually escape to freedom. The stories of his escape are likely lost to history, but we can always hope that a family member from Southbridge will stumble across this humble website and contribute some information to flesh out the story. It’s happened in the past with similar stories……………. I’m hoping it happens here…………. Walter J. Ciesla was born on August 22nd, 1922 to Joseph and Anna Ciesla (Zabek) in Southbridge, Massachusetts. Walter enlisted and was selected as a member of a B-24 bomber crew. As a member of the Mason Crew of the 718th Bombardment Squadron, 449th Bomb Group, Walter Ciesla was shot down on November 8th, 1944 and evaded capture by the Germans. His crew members at the time were Verne J. Pinix, Gordon B. Tolman, Richard J. Slade, George P. Mason (pilot), William J. Williams and Michael J. Nosal. Many followers of PortraitsofWar.wordpress.com know that I have a strange passion for WWII amateur color photography. In this case, I luckily remembered that anniversary of the Battle of Tarawa is upon us and decided to post some of of the material I’ve acquired over the years that directly relate to the Battle of Tarawa. When the Marines landed on the Tarawa (Gilbert Islands, Micronesia) on November 20th, 1943, a pilot who launched from the USS CHENANGO (CVE-28) snapped a series of 35mm color photos while flying overhead providing fighter support. And an actual aerial color snapshot taken during the opening hours of the November 20th, 1943 invasion. The pilot had his 35mm camera with him and snapped dozens of shots during the initial invasion; the following shots are the only known aerial color photos of the Battle of Tarawa! Check out this intriguing short 13 minute video by Tested.com about a professional WWII turret restoration expert. Sorry for any advertisements that may show in the video. ; it’ not my intent to show them, but it’s sadly the cost of interesting online media in the 21st century.